Brand new for 2018, we visit glamorous Sicily for a sociable week of golf. 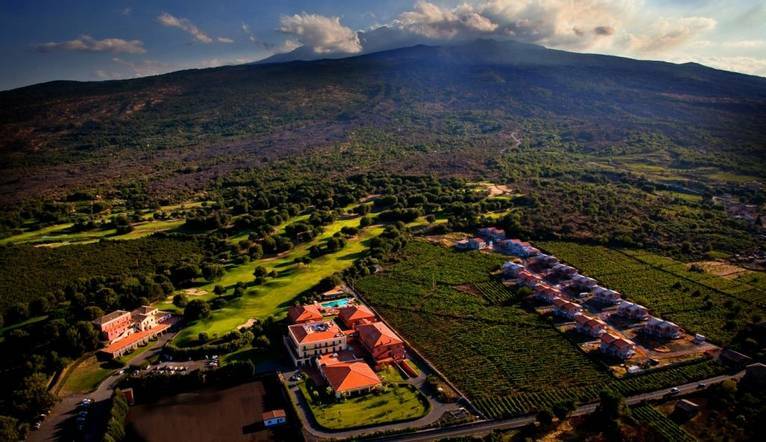 Nestled in the foot hills of iconic Mount Etna, we can look forward to four rounds of included golf on this unique golf course which commands fantastic views of this beautiful island. In our free time we can explore our surroundings further on an optional excursion or relax in our hotel’s extensive spa facilities. The largest island in the Mediterranean, Sicily offers everything you could hope for from a relaxing golf holiday. Its cultural diversity makes it a truly fascinating place to visit, having been invaded or occupied by numerous civilisations over thousands of years, each leaving its mark on the landscape and architecture. On the slopes of Mount Etna in an unrivalled location the Il Picciolo Golf Club Is the first 18-hole 72-par course to be built in Sicily. Opened in 1989 and designed by the renowned architect Luigi Rota Caremoli who is the only Italian to be a member of the Association of British Golf Course Architect. The challenging holes on this superb course are fashioned from the characteristic lava stone of Mount Etna. It covers 5,870m and offers a driving range and putting and pitching green. The course played host to the Ladies Italian Open for three years between 1995 and 1997 and again in 2011. The European Senior Open was also held here in 2010. Mount Etna has recently been declared a UNESCO world heritage site, and our hotel commands unrivalled views over the North-Eastern slopes of Europe’s largest volcano. It is set in a truly stunning landscape with abundant vineyards and orchards making the most of the fertile soil. On our non-golfing days, we can explore further afield with a range of optional excursions to look forward to. Discover bustling Taormina with its ancient amphitheatre, ancient Syracuse and smouldering Mount Etna (subject to availability and minimum numbers apply). Or, if you would prefer to relax and unwind, then we can make full use of our hotel's well-equipped spa facilities. Located between Mount Etna Park, Nebrodi Park and the River Park of Alcantara. Built inside a historic farm house the hotel has been fully renovated and has indoor and outdoor pools, three restaurants (one of which is in the Club House) and a lounge bar. There are extensive spa facilities of over 1000m² at the hotel including a sauna, hammam area, water paradise area, whirlpool, water therapy pool, relaxation area, tisane area and state-of-the-art fitness area. For an extra treat you could book yourself a treatment which focus on holistic, sporting and beauty-orientated treatments (extra charges may apply). All the well furnished rooms feature air-conditioning, satellite TV, hairdryer, safe, free Wi-Fi and a phone (extra charges may apply). The transfer time from Catania Airport to the Hotel is approximately 1 hour, depending on weather and traffic. 4 rounds of organised golf at the Il Picciolo Golf Club. This trip is for golfers with a handicap of 36 or lower for ladies and 28 or lower for gentlemen. Please advise our Reservations team of your handicap at the time of booking, and if you have a certificate please ensure you take it with you on the trip. This enables the Tour Leader to assess everyone’s ability, so that rounds and competitions can be organised fairly. We suggest a Group Collection to cover transfer drivers, and hotel staff of €15.00 per person. Your Tour Leader will collect this on your behalf and distribute it accordingly, thus relieving you of the burden of who, when and how much to tip. The tipping of housekeeping will be left to your individual discretion (a small amount left in your room on departure should cover this and would be much appreciated). As is customary, ‘the hat’ will be passed around for the driver and guide on all optional excursions. For any meals that are not included in your itinerary, or taxi fares, your Tour Leader can advise of an appropriate Ϻdd on. A full 10-year passport is required, valid for the duration of your stay. Holders of a British passport do not require a visa.